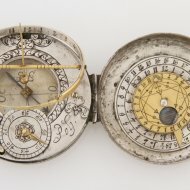 SOLD Universal equinoctial dial by Nicolaus Rugendas (III), Augsburg for latitudes 30-65 North. 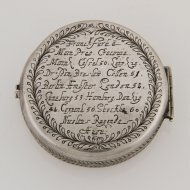 Round silver case containing the silver dial which has a gilded brass hour-circle and gnomon. 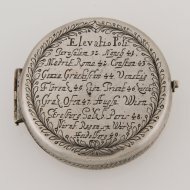 The front and back of the case are engraved with laurel wreaths, within which is contained a table of latitudes comprising cities and tables in Europe. 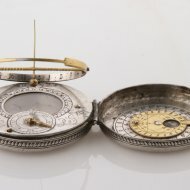 The dial-plate is silver and engraved with leaves and has a circular pattern around the compass. 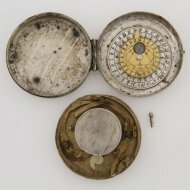 The latitude scale is engraved on a small circle and divided anticlockwise. 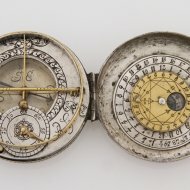 There is a rotatable index arm attached to the centre of this circle, which is linked to a cam and spring mechanism for setting the angle of the hour circle, the latitude. 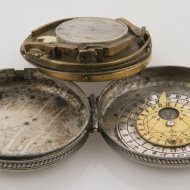 The compass, also silver is set into the dial-plate. The cardinal points are marked in Latin initials and the magnetic variation is marked at 11 degrees West of North (for ca. 1710). The needle is blued, in the form of an arrow and surmounted by a brass pyramidal pivot and covered with a glass plate. 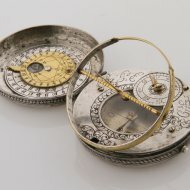 The hour-circle is spring-loaded, hinged and made of gilt-brass with silver inset in its inner rim. 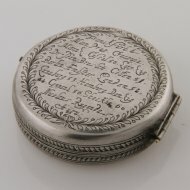 It is engraved with hours and numbered clockwise 3-12, 1-9. A pivoted, turned gilt-brass strut across the East-West diameter supports the rod gnomon, which has a weight at one end. 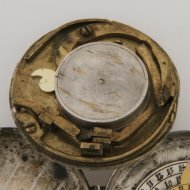 When a small button is pressed near the 40 of the latitude-dial the hour-circle and the gnomon are set in position (the gnomon by its contra weight). When the hour-circle is pushed back the gnomon also goes to the transport position. 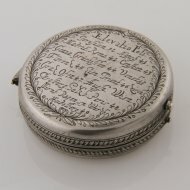 In the other half of the silver case is a silver moon-dial and a gilded turnable disc and are used to read the time on the moon-dial when there is enough light from the moon. 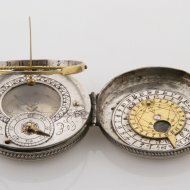 In the collection of the National Maritime Museum in Greenwich is an almost similar dial, without the moondial, from Johann Martin, Augsburg. 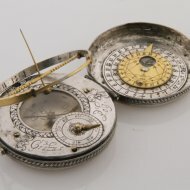 (See Sundials at Greenwich, page. 137).